Before moving into a new neighborhood here are five things to check out. If you're planning on moving to a new location, the neighborhood should be just as important as finding the right house. 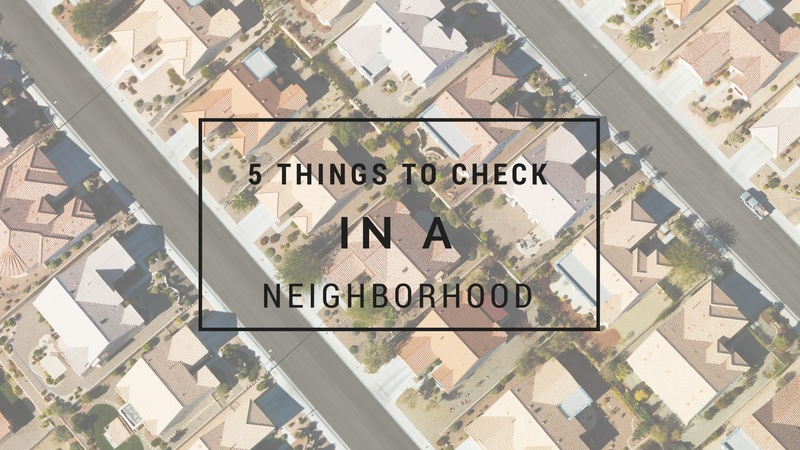 In addition to checking out the integrity of the house and property itself, here are five things to investigate about your neighborhood. You can visit websites like watchdog.org and safe wise.com to check crime reports for a particular area. As a real estate agent, we cannot steer you in one direction or another but we can provide information on how to get your own research and information. #2. Are there any plans in the future for the neighborhood? The neighborhood might look great now, but it's important to check out if there will be huge construction going on next-door within the next few years. A new community or new development could add traffic to the neighborhood streets and impact local schools. Talk with your city about zoning laws and plans for any future development around you. The first visit might sound great but then the second or third visit to the neighborhood during different times could reveal new information. If nobody is home during the day but everybody comes home at night, you may discover block parties and loud neighbors, something you don't want to live with when sure there. #4. Check out the neighborhood's Nextdoor.com website. Not all neighborhoods and communities have a next-door page, but if they do, it is a treasure trove of information if there is one. It can give you a good idea on the people that live there, the camaraderie, and what to expect with your neighbors. #5. The neighborhood may be all renters. No offense to renters, but, too many renters in a neighborhood could actually bring down the home's value. ZIP Code with higher than average concentration of renters has lower property values compared to other homes within the same city or county. It's important when buying a house to do your research not only on the house itself but the neighborhood and surrounding community. Check out the commute times, local schools, and access to amenities such as markets and restaurants. All of these play into finding the perfect house for you.